When San Francisco State University Professor of Biology Zheng-Hui He was an undergraduate, he learned a curious fact about some plants: The way they store the energy of light is horribly inefficient. Now he’s part of a research team that’s figured out a way to use genetic engineering to streamline the process, pumping up the productivity of rice plants. The resulting rice has a long way to go before it’s a consumer product, but it may in time help curtail food shortages by giving a needed boost to one of the world’s most important crops. “By 2050 our planet will have to feed 9.7 billion people,” He said. But many possible approaches to meet increased future demand for food — like expanding cropland or farming existing land more intensively — are limited and would be destructive to the environment. Improving the efficiency of the plants themselves has the potential to meet the same need with a dramatically smaller footprint. 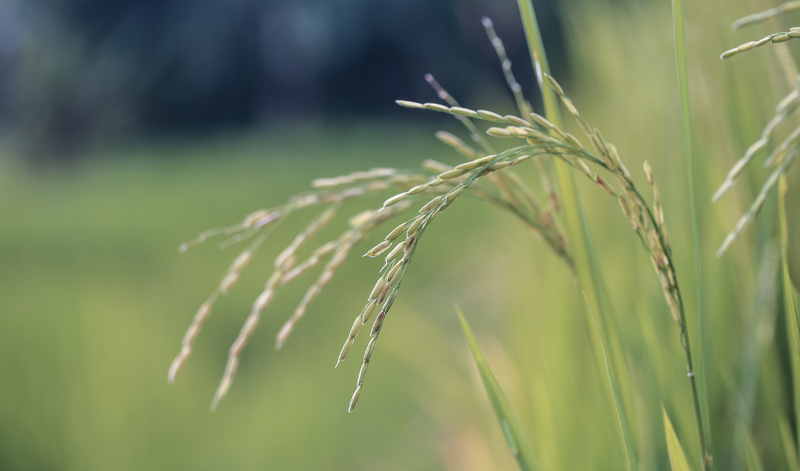 With that in mind, the team used a specially engineered bacteria species to insert three genes into the DNA of rice plants to retool them for higher efficiency. Then the researchers took to the field to see if their improvements worked. Three years of raising the plants in rice paddies in Southern China showed that the tweaked plants were up to 22 percent more efficient, producing as much as 27 percent more grains of rice. The researchers published their work Jan. 10 in the journal Molecular Plant. The process the team set their targets on is called photorespiration. When storing the energy from sunlight, some plant species spend precious carbon dioxide manufacturing a toxic byproduct. Then they pump that toxin elsewhere and break it down, wasting the raw materials. The new and improved rice plants engineered by He’s team instead do something like recycling. “It’s like your paper, your plastic, your aluminum — it’s going to go in the waste and pile up and cause problems somewhere else,” he said. “We direct it into the right place and reprocess it into a raw material so it can be used again.” Creating the fix required the technical know-how to edit genes as well as a detailed understanding of how to optimize the performance of tiny pieces of cellular machinery. This isn’t the first study to tweak crop plants to make them more efficient. Similar work has been done in non-crop laboratory plants, and the study also comes hot on the trail of a similar one on tobacco plants. But there are some important differences. While those researchers spliced genes from different forms of life, like bacteria and other plant species, He’s team instead inserted genes that originated from the same species of rice. That may make it easier for the resulting product to clear regulatory hurdles, and the focus on a widespread food crop means that He’s team is already one step closer to contributing to the fight against food insecurity. Before the newly engineered rice makes its way to your dinner plate, the plants will have to undergo years of further testing for productivity, safety, nutritional value and taste. In the meantime, the team will keep fine-tuning their rice while also looking for a similar fix in several other crops. The project came out of a collaboration between He and South China Agricultural University Professor of Biology Xin-Xiang Peng that began when the researcher worked as a visiting scientist in He’s laboratory in 2002. He explains that seeing poverty in his childhood village in China in the 1960s and 70s served as a motivation for addressing food insecurity in his work. “I’ve personally seen starvation, people really hungry,” said He. “As plant biologists, we have an obligation to do something about it.” And using cutting-edge technology to fix a flawed biological system was satisfying, too, he says. “When you can take something impossible — a ‘what-if’ science fiction question — and make it become reality, I think that’s a dream come true for any scientist,” He said.